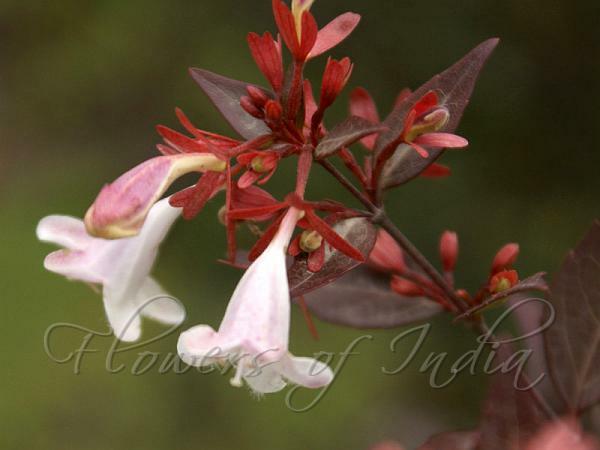 Glossy abelia is an evergreen shrub with arching branches and a rounded shape, which can grow up to 10 ft tall, and as wide as 12 ft. In reality the garden specimens are about 3-5 ft tall. Oppositely arranged glossy, dark green leaves are about 1-2 in long and half as wide. The fragrant, funnel shaped flowers are white, tinged with pink, and about an inch long. The long lasting sepals are rose pink in color, spreading. There are several named cultivars in the trade, including some with darker pink flowers, some with yellow or variegated leaves, some with a creeping habit, and some that stay small. 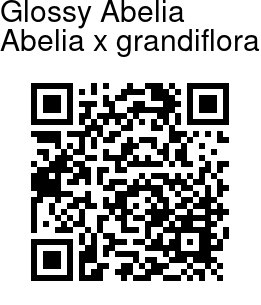 Glossy abelia is a hybrid species that resulted from a cross between the deciduous Chinese abelia (Abelia chinensis) and an evergreen species A. uniflora, also from China.